At the Shambhala Meditation Center of Portland, we practice and teach mindfulness-awareness meditation as it has been passed from teacher to student for more than 2,500 years. We provide an environment where each person can engage in the practice of meditation at their own pace. If you want to practice meditation in a group environment, you are welcome to attend any of our weekly community practice sessions with no commitment or requirement to follow a particular course of study. Please feel welcome to drop by. No previous experience required! We offer free meditation instruction every Tuesday evening at 7:00 p.m. and on the first Sunday of each month at 9:30 a.m. If you would like to receive meditation instruction, come to the Center a few minutes before our 7 p.m. on Tuesday evening or 9:30 a.m. on the first Sunday and ask to receive meditation instruction. Note that sitting practice on the third Sunday of the month has been discontinued. Every other month we offer a Saturday morning Learn to Meditate Workshop: Turning the Mind Into An Ally, from 9:00 a.m. – 1:00 p.m. This workshop is ideal for anyone wanting an introduction to meditation, as well as those wanting to refresh their practice. Based on the national bestseller, Turning the Mind into an Ally by Sakyong Mipham Rinpoche, this workshop explains how “peaceful abiding” meditation enables us to cultivate our mind’s inherent stability, strength and clarity. The workshop includes practical instructions for developing a strong meditation practice: good sitting posture, how to relate with breathing as the object of meditation, what to do when thoughts come up, and starting a regular meditation practice at home. Check our introductory programs listing for the next Learn to Meditate workshop. 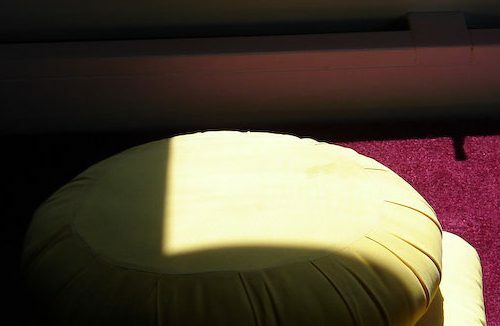 Our bi-monthly Open House, on the second and fourth Tuesdays of the month, offers a friendly introduction to meditation practice, Shambhala Buddhist teachings and our community. Our evening sitting is followed by a brief Dharma talk or video, after which there is group discussion. Everyone is welcome. Although the essential techniques are written down in many places, meditation remains essentially an oral tradition, and individual personal instruction is important. We offer a variety of programs throughout the year appropriate for people new to meditation. In addition to our Learn To Meditate workshops, the following programs have no prerequisites and are geared for newcomers: Shambhala Training Level I, Meditation In Everyday Life, and Contentment In Everyday Life and the Basic Goodness Series. Check our programs listing to learn when these and other classes are being offered. For articles about meditation, online teachings and recommended readings, visit Shambhala’s meditation resources page and the Shambhala Sun’s How to Meditate page.